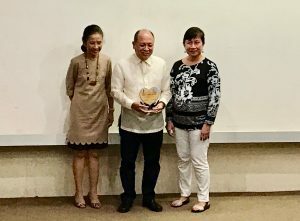 Dr Carmen Velez, President and Chairman of the Board of Trustees, Dr Thelma Fernandez, Dean of the Cebu Institute of Medicine, Dr. Josefina Poblete, Medical director of Cebu Velez General Hospital, members of the board of trustees, ladies and gentlemen. Adamas, the greek origin of the word diamond, CIM celebrates its 60th year, the diamond year, living up to what Adamas stands for, unconquerable and enduring. The value of a diamond is measured by 4 Cs: Cut, Clarity, Color, Carat weight. has the greatest effect on a diamond’s beauty. Parents, Family, schools and training institutions may have cut him to what he is now but the brilliance is all his own. He was born to Silverio and Francisca on September 23 1955. He is married to Valerie Macasero and has 2 sons Ron David and Dave John. His son is now a 2nd yr student here at CIM. His education spanned Luzon, Visayas and Mindanao. Each time leaving a mark of excellence in study and work. He is a graduate of Class1980 at the Cebu Institute of Medicine, an ESA awardee. At the Cebu Velez General Hospital Pediatric Residency program, he was chosen to be the chief resident on his final year. Being a person who loves to take up a challenge, he decided on the complex subspecialty of cardiology because it was the only one with a training program in the country. 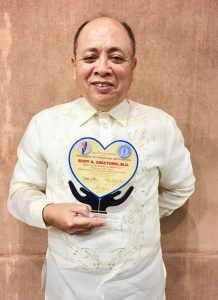 He trained at the Philippine Heart Center for Asia, where he was chosen chief fellow on his final year. Because there was another step available, he took that step and further trained in Invasive cardiology at the same institution. Coming back to Cebu, he cut his way into the practice of general pediatrics, pediatric cardiology, academe and service. A teacher par excellence, he makes the complicated and intimidating cardiology simple and effortlessly comprehensible. He educates his students and also his patients and parents of his patients, thus, earning himself the outstanding faculty award more than once. Recently, he went back to train for the non invasive closure of PDA, FULFILLING A DREAM TO BE A SURGEON, SO TO SPEAK. The most valuable and rare diamonds are clear and colorless. Although our awardee leads a very colorful life because of his passion, he lives it without prejudices and and is quick to find if prejudices exists, always seeking the truth and what is right. As the chairman of the CVGH pediatric training program and a long time training officer of PSH, HE IS ABLE TO FIND THE GEM HIDDEN IN HIS RESIDENTS AND WILL CUT! Definitely cut! but I have also been witness to his SURPRISINGLY gentle side wheN he sees a babbling and pale resident. He currently sits as a member of the board of trustees of the PPS central Visaya’s chapter. A watchdog of its integrity and service to the community and its members. The measurement although physical in the diamond, in a person, it is character. Our MOCA awardee without doubt, does all things well. His passion for learning is daily, waking up as early as 3 in the morning to study. He serves the community by giving expensive services for free even when PHILHEALTH does pay. He has literally braved stormy seas to train people in PALS courses, again, for free.. I was one of his first mentees. I love him dearly. Yesterday, another mentee of a much younger generation introduced him and also mentioned he is well loved, a testament to what he is. A diamond, best friend, well loved. Cut, clarity and colour and carat weight. The 4 Cs by which a diamond is measured. The Most Outstanding CIM Alumnus on its diamond year, was measured by yet a 5th C, CIM:Competence-Integrity-Mission and was deemed excellent. A physician of the heart with a heart. Ladies and gentlemen, it is with extreme pride and honour that I present the recipient of the Most Outstanding CIM Alumnus, Dr Rudy A. Amatong. 2017 CIM MOCA Awardee Dr. Rudy Amatong obliging for a pose with his award.